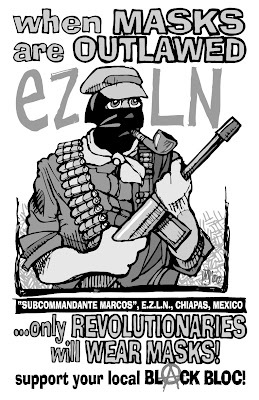 If you have any doubts about the Maori radical/anarchist/Zapatista connection, check out this 2001 article from a Maori website. What does the Zapatista struggle mean here for Aotearoa? It certainly validates Maori calls for Tino Rangatiratanga. It also suggests that indigenous emancipation in Aotearoa may not exist in a state like structure. It could mean that the white overalls will also be visible here in Aotearoa and that a new generation of activists will be marching against the the multi-nationals and their puppet state with questions on their lips. "Or it could be that liberation in Aotearoa is only a ski-mask away......."
Mad Socialist "Troika" To Dictate Labour Laws? Iti Planning "IRA Style War"?